Most of the time, when man-made machines come face-to-face with vast fields of sea ice, it’s mankind who lose out (see: Titanic). But in this image from NASA’s Operation Ice Bridge, we get a rare look a humans imposing order on the planet’s unruly machinations. Operation IceBridge is an annual NASA mission, which involves sending two flights all the way along the North American side of the Arctic Ocean — basically, Greenland to Alaska and back again. The planes use a variety of sensors to record the thickness, height and characteristics of the ice — a job that can’t quite be done by satellite, yet. According to sea ice scientist Sinead Farrell, the image shows typical, mildly deformed first-year sea ice. Small pressure ridges and sastrugi (snow dunes) are visible on the surface. What’s uncommon about the image, however, is that it was captured during first few hours of twilight. 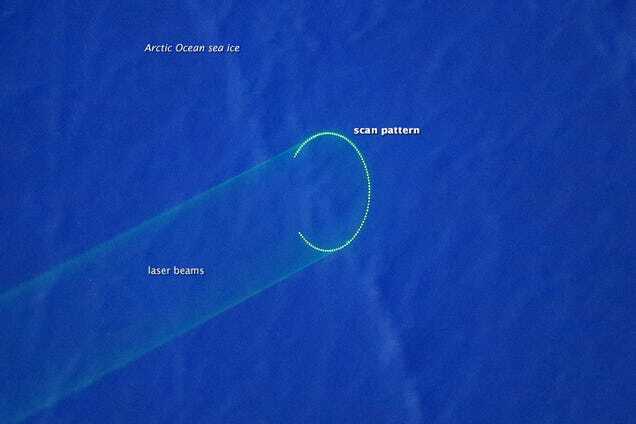 The lack of sunlight provided an opportunity for the DMS to get a glimpse of laser beams scanning the sea ice. Next to the DMS in the belly of the plane, the Airborne Topographic Mapper (ATM) sends pulses of laser light off of a rotating mirror and onto the ice below. This photo shows the elliptical scan pattern of the ATM as it made 94 laser shots in the one-thirtieth of a second that the DMS camera shutter was open. By timing the round-trip journey of the light pulses and accounting for the location and altitude of the plane, scientists can determine the height of the ice surface. Flying the same path every year provides detailed information about how the surface height of the ice has changed. This information in turn contributes to calculations of sea ice thickness in these areas, which scientists have shown to be thinning. The annotated version of the image below helps explain the breakdown.